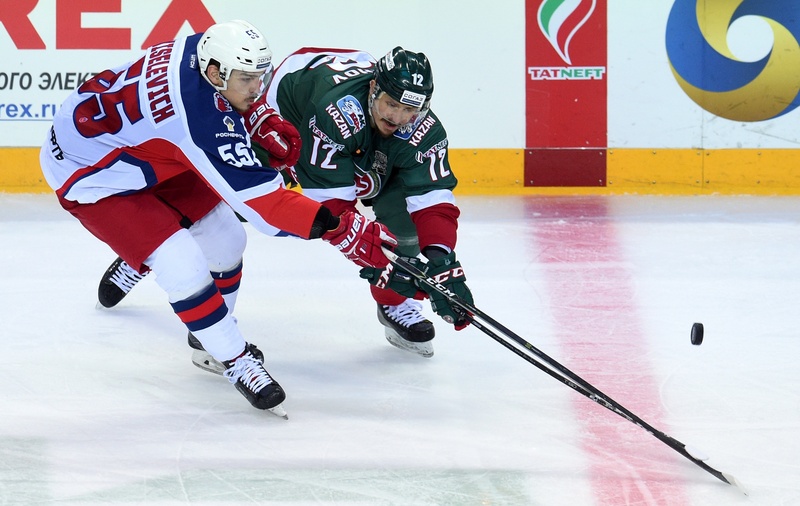 Game one of the Gagarin Cup Final ended in a 2-1 victory for Ak Bars over CSKA. After the game, some of the key players shared their thoughts about the action. “The guys did great. Everyone played his part, we all battled and showed disciplined hockey. Now it just keeps getting harder. We need to be ready, keep playing our game and give it the full 60 minutes. “For my second goal, I always knew exactly where Danis [Zaripov] was going to put the pass. Volodya Tkachyov gave a great feed for the first goal as well. “We knew it wouldn’t be easy, we expected CSKA to be dangerous on the counter. We gave up a goal, but we never panicked. We pressured their defense, forced mistakes and in the end we got what we wanted. “We expected a tough game and we were prepared for it. We got two big goals and we all did our jobs, but things will be more difficult in the coming games. “We need to get more pucks to the net, get more shots away and pose more of an attacking threat. Unfortunately we couldn’t do that today, but we’ll work on it. We’ll sleep on it, think it over. The next game will be different. “We took two penalties for too many men, and that’s something we’ll have to look at ahead of the next game. It’s a matter of collective discipline. If we’re getting penalties like that, we have to sort it out.